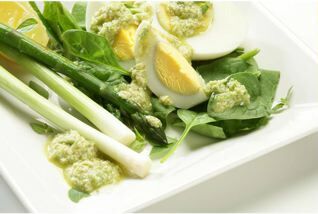 This versatile dressing can also be thinned with mayonnaise for a dip. Delicious over hard boiled eggs and fresh tomatoes. 1) Put all ingredients into a blender, slowly pouring in oil until pureed. Season to taste with salt and pepper. 2) Yields 2 cup. Keep in mason jar in fridge. If doing a cold plate – change it up with cherry tomatoes, asparagus spears, cucumbers and canned tuna.